Do you love Spinach and Artichoke Dip? 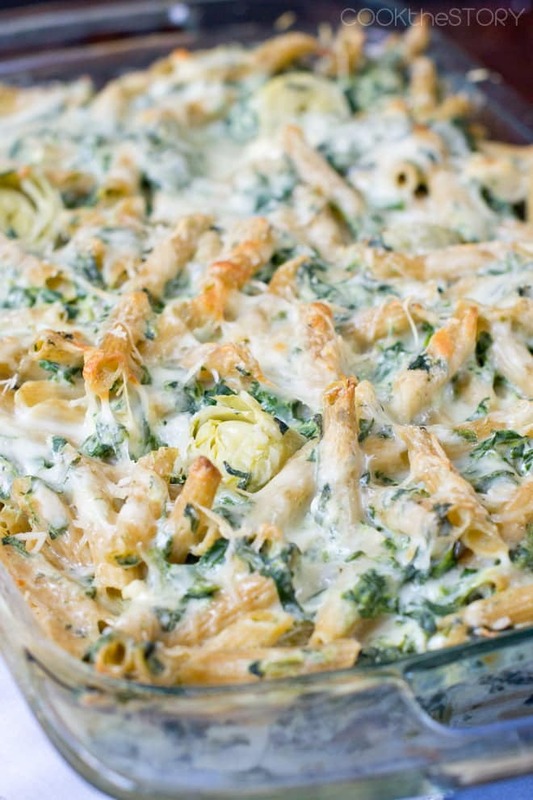 Well now you’re gonna have to love Spinach and Artichoke Pasta Bake too. So love away. It’s inevitable. I’m obsessed with turning things into pasta bakes. It’s usually because I have leftovers and want to just toss it all together in a pan and be done with making dinner. Yes, I totally do that. All the time. I cook up some pasta, put it in a big casserole dish with whatever the leftovers are (think roast chicken and steamed broccoli). Then I add some tomato sauce and cheese and bake it up. Today’s Spinach and Artichoke Dip originated because there was a tub of spinach artichoke dip in the fridge that was about to reach its expiration date. I added it to a baked pasta dinner. It was sooooo good. I decided that I just had to recreate that but I didn’t want to have to buy several tubs of pre-made dip to do it. 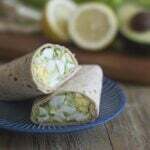 This version uses cream cheese, mayonnaise, frozen spinach and canned artichoke hearts to get that spinach and artichoke dip flavor. There’s also some cooked chicken meat and mozzarella in there. It’s super tasty. Here it is! 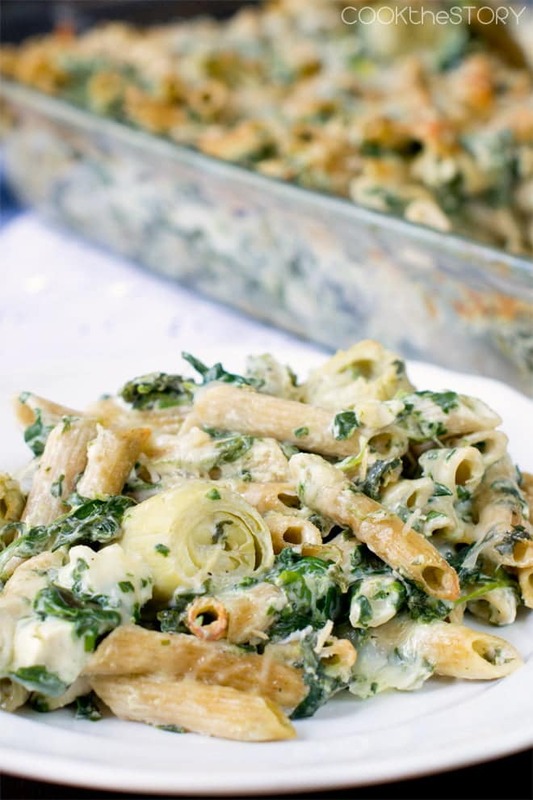 My recipe for Spinach and Artichoke Pasta Bake. Do you love Spinach and Artichoke Dip? 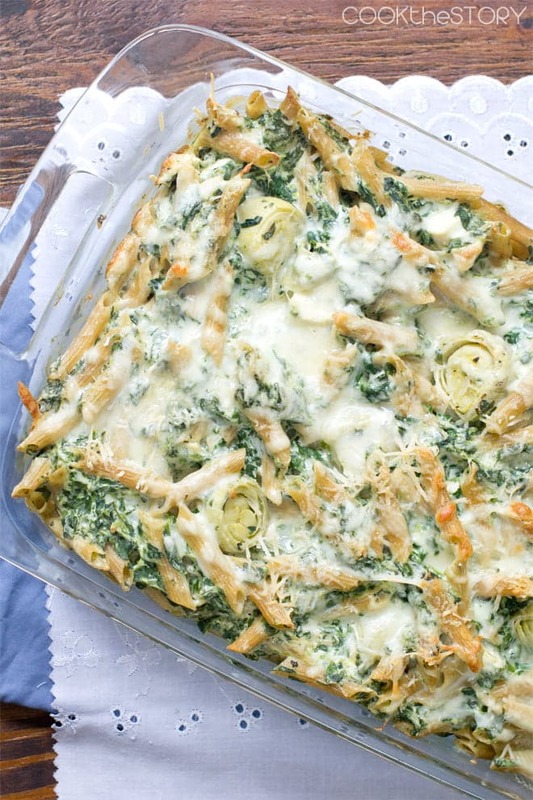 Well now you're gonna have to love Spinach and Artichoke Pasta Bake too. So love away. It's inevitable. Cook penne pasta according to package directions. Drain and set aside. Put spinach in a large microwave-safe bowl and defrost in the microwave. Add cream cheese and warm 30 seconds. Stir. Heat for another 30 seconds. Stir until smoothly combined with the spinach. Add mayonnaise, garlic powder, salt and pepper. Return drained pasta to pot along with spinach sauce, 1 cup of the shredded mozzarella, diced chicken, and baby artichoke hearts. Stir until all the pasta is coated. Turn into a 3-quart, 13x9" pan. Top with the remaining 1/2 cup mozzarella and with the Parmesan cheese. Bake until heated through and browned a bit on top, about 30 minutes. This post was originally published in October, 2015 and was fully revised in August, 2016. How do you cook the chicken? Boiled or baked? Colleen, You can cook it any way. 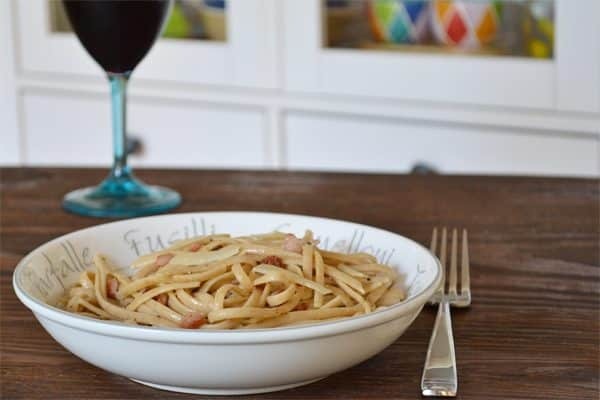 I usually use leftover roast chicken or a rotisserie chicken from the grocery store. But you could poach chicken breasts instead. 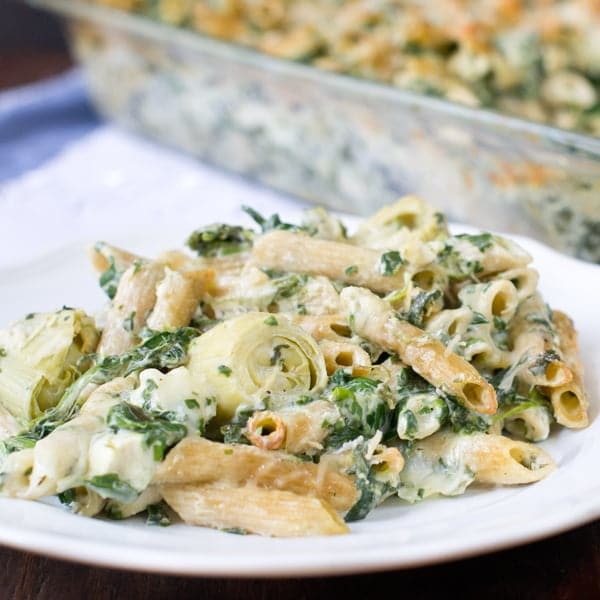 do you drain the spinach before adding the cream cheese? Dianne, No. 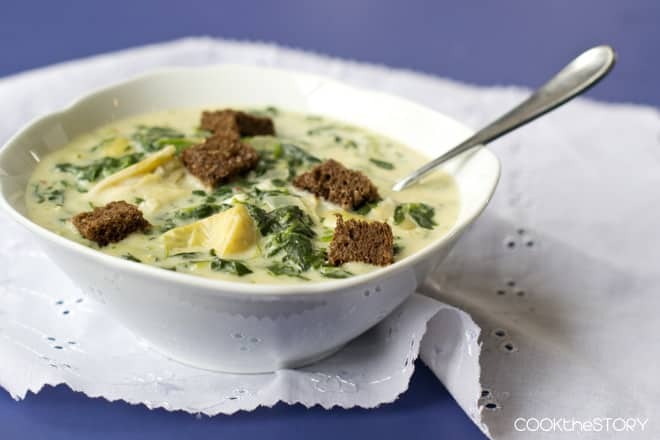 The liquid from the spinach mixes with the cream cheese to make a sauce. Hi there, it sounds delicious. But I now have a tub of spinach artichoke dip that I need to use, how do I make it with that? 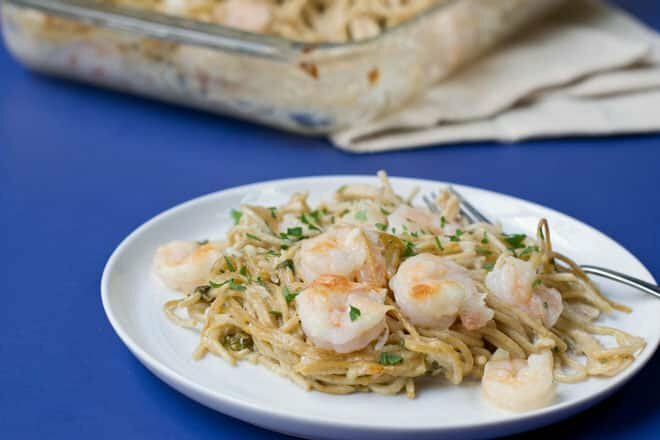 Cook the pasta and then add your artichoke dip to it, a little at a time and taste as you go. You want it creamy and flavorful. Then put it in a pan and top with mozzarella cheese and bake it. I want some now! YES! 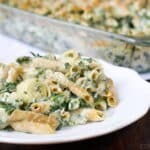 I DO love spinach and artichoke dip and I’m sure I will love this too! Looks so creamy and delicious! I love pasta bakes, too! 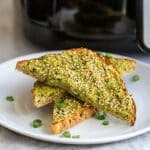 It’s the best way to combine leftovers, and I love how you came up with this idea by using your leftover dip! This looks amazing! 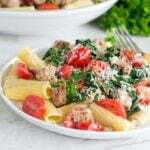 My kids almost love anything and everything pasta :) so I like your way of turning any leftovers into pasta dish.. very creative. 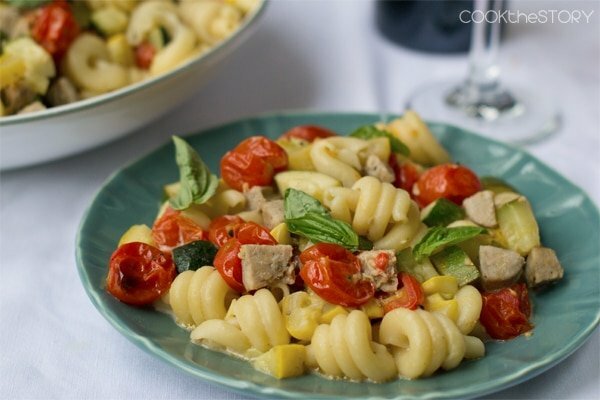 I want a giant heaping plate full of this pasta! !